For a year before Desert Storm I kept hearing tank tracks rumbling in my ears. Then when Desert Storm started the noises stopped. Now I see this vision! Note from David: This vision is obviously prophesying a great loss of American troops in the Middle East. I believe when this does happen the troops from Ft. Hood at Killeen TX. will take the major hit. Please pray for God's elect to be spared. Then JESUS spoke to me, saying, "Come - let me show you more". This is when I saw the Persian Gulf region, and there was a whole lot of activity. I saw Russia invading Iran, and another invasion of troops into Iran, coming from Afghanistan. Jesus revealed that Russian troops were having a hard time, being blocked by fanatical Iranian troops in the mountain passes. I saw American troops being rushed in by air and ship and assembling in Saudi Arabia. Jesus then said, "FLEETS". And I now saw fleets of war ships, many nations, assembled in the Arabian Sea and near the Strait of Hormuz. Then, from Iran, I saw a missile being fired which streaked over the Persian Gulf, from Iran, and exploded over the masses of assembling U.S. troops - a nuclear fireball consumed them in an instant, and many of the oil fields caught fire - the whole land was ablaze in this deadly holocaust. The heart of the U.S. Army was wiped out in one blow. 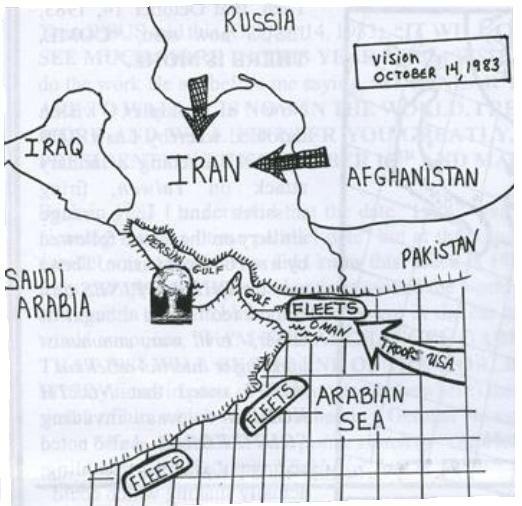 I made a note in my record of October 14, 1983 as follows: "Does Iran have the bomb?" I had no idea that Jesus was showing me what would come more than 23 years later. Note from Chuck's letter on 12/20/06: We know from Jesus' Word that the President has opportunity to escape this "war trap" up until and ending May 16, 2007 - after that here is no escape, only desolation. Note from David: I believe Iran's nuclear facilities will eventually be hit with conventional weapons by Israel and the U.S., which could start the great Middle Eastern war before the tribulation. However, in the list of nations subdued by Babylon in Jeremiah 25, Iran along with the Medes will be destroyed just before the last war when the remnants of all the nations rise up against Babylon at the end of the tribulation. The same timing is shown in Jeremiah 49:34-39 when Iran is struck by Babylon just before chapter 50 when Babylon falls. I believe it may be at this time that Iran will take out a whole U.S. army with one nuclear missile as Chuck saw in the vision. Of course, the U.S. would destroy Iran with nuclear weapons afterwards but the U.S. military would be severely weakened. This would set the stage for the attack on the U.S. by the nations. MOSCOW, April 3 (RIA Novosti) - The chief of Russia's General Staff said Monday he could neither confirm nor deny reports that Ukraine had sold 250 nuclear warheads to Iran. "Russia's General Staff has no information about whether Ukraine has given 250 nuclear warheads to Iran or not", General Yury Baluyevsky, also deputy defense minister, said in response to an article in Novaya Gazeta newspaper Monday. "I do not comment on unsubstantiated reports". The newspaper said that Ukraine had failed to return 250 warheads to Russia in the 1990s when the former Soviet republic declared itself a nuclear-free zone. The paper suggested the warheads could have been sold to a third country, including Iran. Then the Russian general takes a surprise turn: 'Now, as to whether or not Iran has tested something like that. Iran does have nuclear weapons', Baluyevsky said. 'Of course, these are non-strategic nuclear weapons. I mean these are not ICBMs with a range of more than 5,500 kilometers and more". Now this is shocking news, indeed! This Russian general has just confirmed that Iran has nuclear warheads and theater missiles with which to deliver them! And, he seems not to be concerned because these warheads cannot yet hit Russian soil. If Iran has nuclear weapons and the missile capability with which to deliver them to Israeli targets, then the entire calculation of military balance in the Middle East may just have changed. Iran has successfully developed ballistic missiles with the capability to carry nuclear warheads. Detailed analysis of recent test firings of the Shahab-3 ballistic missile by military experts has concluded that Iran has been able to modify the nose cone to carry a basic nuclear bomb. The discovery will intensify international pressure on Teheran to provide a comprehensive breakdown of its nuclear research programme. Last week, the United Nations Security Council gave Iran 30 days to freeze its uranium enrichment programme that many experts believe is part of a clandestine attempt to produce nuclear weapons. Iran denies it is trying to acquire a nuclear arsenal. But ballistic missile experts advising the United States say it has succeeded in reconfiguring the Shahab-3 to carry nuclear weapons. The Shahab-3 is a modified version of North Korea's Nodong missile which itself is based on the old Soviet-made Scud. The Nodong, which Iran secretly acquired from North Korea in the mid-1990s, is designed to carry a conventional warhead. But Iranian engineers have been working for several years to adapt the Shahab-3 to carry nuclear weapons. "This is a major breakthrough for the Iranians", said a senior US official. "They have been trying to do this for years and now they have succeeded. It is a very disturbing development". The Shahab 3 has a range of 800 miles, enabling it to hit a wide range of targets throughout the Middle East - including Israel. Apart from modifying the nose cone, Iranian technicians are also trying to make a number of technical adjustments that will enable the missile to travel a greater distance. Western intelligence officials believe that Iran is receiving assistance from teams of Russian and Chinese experts with experience of developing nuclear weapons. Experts who have studied the latest version of the Shahab have identified modifications to the nose cone. Instead of the single cone normally attached to this type of missile, the new Shahab has three cones, or a triconic, warhead. A triconic warhead allows the missile to accommodate a nuclear device and this type of warhead is normally found only in nuclear weapons. According to the new research, the Iranian warhead is designed to carry a spherical nuclear weapon that would be detonated 2,000 feet above the ground, similar to the Hiroshima bomb. Although US defence officials believe that Iran is several years away from acquiring nuclear weapons, they point out that the warhead could hold a version of the nuclear bomb Pakistan is known to have developed. Iran has acquired a detailed breakdown of Pakistan's nuclear weapons. The development of the Shahab-3 is just one element of a wide-ranging missile development programme. In 2003 the Iranians concluded another secret deal with North Korea to buy the Taepo Dong 2 missile, which has a range of 2,200 miles and would enable Iran to hit targets in mainland Europe. Earlier this week the Iranians announced that they had successfully test-fired a new missile, the Fajr-3, which has the capability to evade radar systems and carry multiple warheads.